Techdirt Podcast Episode 97: Can Tech Be Trusted Without Antitrust? While the United States finally passed net neutrality rules this year, the FCC's decision to not ban zero rating (exempting some content from usage caps) has proven to be highly problematic. ISPs like Comcast, AT&T and Verizon have all begun exempting their own content from usage caps, putting competing services like Netflix, Amazon and Hulu (or smaller startups) at a disadvantage. The loophole has also spawned new confusing options from Sprint that throttle games, music and video by default, unless a consumer is willing to pony up $20 or more extra to have those services actually work as intended. So yes, the United States passed net neutrality rules, but its unwillingness to tackle zero rating means that net neutrality is now being hamstrung anyway -- now just with regulatory approval. "Bell says the practice would increase engagement in the digital economy and make telecommunications services more affordable. Differential pricing will "directly benefit consumers in the same way that toll-free long distance, promotional coupons, waived internet installation fees and free previews of television broadcasts do," it told the CRTC." 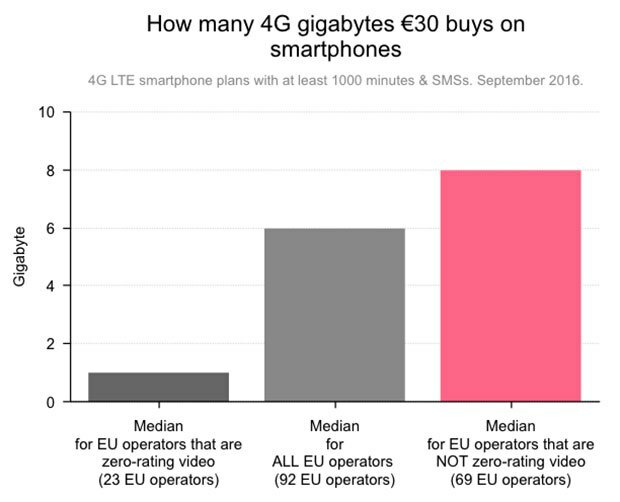 With #EndDataCaps & ban on #ZeroRating, looks like @OpenMediaOrg proposals will raise consumer costs. Whose interests is it looking out for? Right, exept it doesn't work like that. Usage caps aren't really necessary on fixed-line networks. They're utterly arbitrary price hikes, only made possible thanks to a lack of competition in the first place. Once in place, caps then allow incumbent ISPs to zero rate their own content while still penalizing Netflix, adding an entirely new anti-competitive layer to the mix. That's why Finland, Norway, Slovenia, Chile, India, and the Netherlands have simply banned zero rating entirely, realizing it's a slippery slope that unfairly empowers incumbent players. That any part of this mechanism is good for consumers is a fallacy. Those trying to claim that zero rating drives down costs for consumers are effectively trying to convince you that "price hikes in uncompetitive markets lower prices." Don't believe it. "But not all companies agree. David Watt, senior vice-president of regulatory matters for Rogers, says the company is net-neutral. "The customer should make the choice." Critics of differential pricing point out that while promoting a service might be attractive to consumers who use it, using a service or app that isn't preferred could create overage charges. That would have a huge impact on the success of those businesses, and it could slant user behaviour." Why is Rogers opposed to zero rating? Because it got a first-hand look at the concept's shortfalls when the company's streaming radio stations had a hard time getting cap-exempt status from a different Canadian incumbent last year. In other words, these telecom giants are all for any variation of network and service discrimination, as long as they're the ones doing the discriminating. Turn the tables on them, and they're consistently quick to cry foul. While Canada is holding a bunch of hearings, that's certainly no indication they'll actually ban the practice. Unlike more ham-fisted net neutrality violations (like blocking a website or service entirely), zero rating tends to fly under the media's outrage radar. That's in large part because consumers and many tech outlets have been fooled into believing that zero rating is giving users something for free, oddly while those same users are simultaneously paying some of the most expensive mobile broadband prices in all developed nations. Less consumer outrage means less political pressure to ban the practice, resulting in a massive leg up for powerful incumbent broadband providers. "Right, exept it doesn't work like that." Yeah, many people don't get what zero-rating does or will do in the market, especially when they have awful caps and data pricing already. They haven't come to see it as some insidious thing, or it doesn't have a high conspiracy theory entertainment value rating yet, to gain much attention. And it seems enough of them "get what they want" out of it so far. Same goes for media. plus they probably hope not to hurt themselves for zero-rating if they figure that no one will effectively fight it. This is not about the FCC, it's about the CRTC. Not only are they different organizations, but they are in different freaking countries! Maybe he was referring to the point that the CRTC is opening zero rating for discussion, while the FCC just dismissed it as an issue? Q: Comcast has 1TB data cap and $10 surcharge per 50GB. It exempts all NBCUniversal and Xfinity features from this cap. Is this legal? A: Yes, in the US. Q: Comcast has a 1 MEGABYTE cap and a $10.00 surcharge per GB. It exempts all NBCUniversal and Xfinity features from this cap. For a $20 up-charge, all Facebook and CBS content is exempt. For a $10 upcharge, all gaming traffic is exempt. Is this legal? So does that mean that if the discussion results in "Zero rating is just spiffy!" that's going to be a victory in the FCC clearly doing the right thing? No, of course not. That would be stupid. If the argument is that "zero rating" reduces consumer cost, let's compare what happened in the US. Zero rating was approved (or not specifically regulated). "While the United States finally passed net neutrality rules this year, the FCC's decision to not ban zero rating (exempting some content from usage caps) has proven to be highly problematic." maybe post was talking about the first sentence.... was that not okay with you or something? not to mention the same media are owned by the same companies that own the ISP's. But they are very willing to listen to public opinion. As long as media coverage upswings on this issue it will probably be sorted out in the public's favour. Net neutrality means equal access. If Facebook decides to offer 1/8 bitcoin to its users who spend 30 minutes a month watching video ads, is that net neutrality or free market value exchange? Yes it is different and not equal. It is a value exchange not net neutrality. Same for zero rating. Same for any company that makes the risk investment to optimize their streaming or website. At the end of the day, if the content is not popular it will not be watched even with zero rating- just look at a 500 channel cable package.